Good Stuff NW: Sugar Low? Have Dessert! When life gives you lemons, as the saying goes, make lemonade. So when life gave contributor Jim Dixon of RealGoodFood some less-than-luscious apricots, he knew exactly what to do with them. The cool weather we’ve had keeps fruit from developing enough sugar, and the result is disappointment when you expect that sweet taste of summer. While it may not evoke the sun when eaten out of hand, a lot of less-than-perfect fruit can be redeemed with a little help. I love apricots, and this simple trick lets me eat a lot more, even when they’ve been missing the sunshine as much as the rest of us. Cut the apricots in half and remove the pits. Arrange them cut side up on a baking sheet, drizzle with extra virgin olive oil, then enough honey so that each one gets about a teaspoon’s worth. Roast at 350° for about 30 minutes or until they get a little brown. You can eat these warm, but I prefer to chill the fruit. Put the sheet pan in the refrigerator for a few hours, then transfer to a bowl or jar. Be sure to get the collected juices off the pan, too. 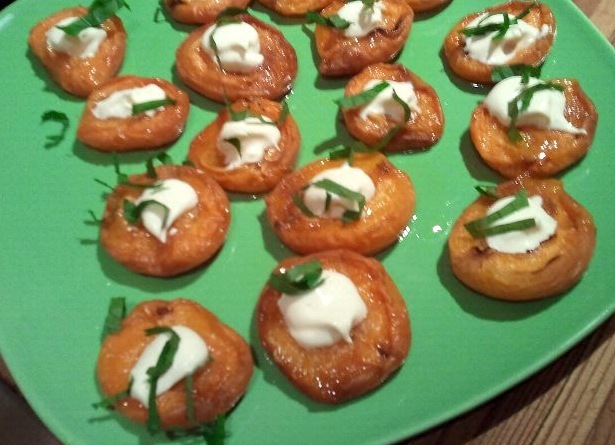 And while they’re good plain, they’re even better topped with a dollop of creme fraiche. To make your own, stir about 2 Tbsp. of Nancy’s yogurt (doesn’t matter if it’s whole milk or nonfat, but I always use Nancy’s because it’s got a lot of live cultures) into a half pint of heavy cream, cover, and let sit in a warm place overnight. Chill for a few more hours and it’ll get even thicker. 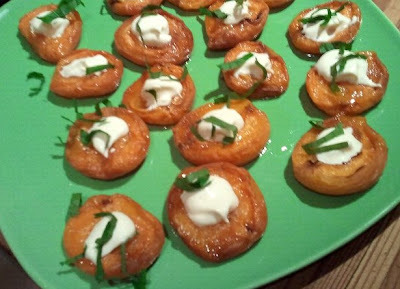 Mix a little of the apricot roasting juices into some of the creme fraiche, then spoon it over the roasted fruit. Garnish with fresh mint for company. Roast enough to have leftovers; I like them plain, too.